Helen is a self-taught ceramicist, having first discovered the pleasure and satisfaction of working with clay when she was at school. 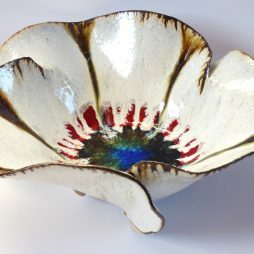 Her fascination with the medium has lasted ever since and after taking numerous evening classes, and working on her own ideas over the years, Helen realised in 2010 that she wanted to be more than an enthusiastic amateur, and has been developing her designs and techniques since then. Helen works exclusively as a hand-builder, concentrating on slab-built forms. Bowls are constructed from three identical pieces which are laid over hump-moulds, then shaped to create space and movement. 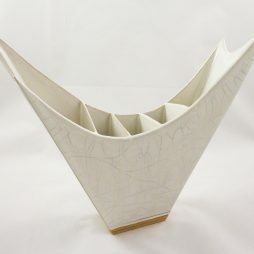 Other pieces are built from multiple slabs cut from templates of her own design, which are then carefully joined. The “Sail Boat” pots – inspired by the shape of yacht sails – explore balance, their narrow form and small bases generating lift and elegance. Glazing adds a whole other dimension for the ceramicist to experiment with. Helen use glazes in a number of ways, sometimes applying a single glaze to let the shape of a piece speak for itself, sometimes layering glazes so they mingle and run, or creating drama by using bold colours on black clay. She takes her inspiration from many sources: her sister’s photographs of Grand Prismatic Spring in Yellowstone National Park were the direct inspiration for several of the bowls, and led to the wider theme of pools – volcanic, glacial, seaside – for others.